A paper presented to the Worshipful Company of Bowyers at a Company Supper on 20 November 2007 by Court Assistant Tony Kench, describing archery in London during the 16th, 17th and 18th centuries, and containing fresh research on the location of the archery marks of the Finsbury Fields on the current-day London map. Although the longbow was in decline as a weapon of war (its last decisive use was at Flodden in 1513), archery remained a popular activity in London throughout the 16th century, encouraged by successive monarchs. 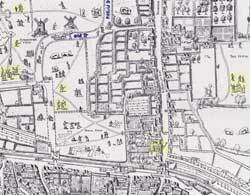 The earliest surviving map of London, the 'Copperplate' map of 1558 (Fig 1), depicts archery taking place in Spitalfields, and also in Finsbury Fields, north of Moorgate. in Spitalfields and Finsbury Fields. The word 'artillery' comes from the French 'arc tirer', to draw a bow, and the Artillery Company (later to become the Honourable Artillery Company) was originally a company of archers. 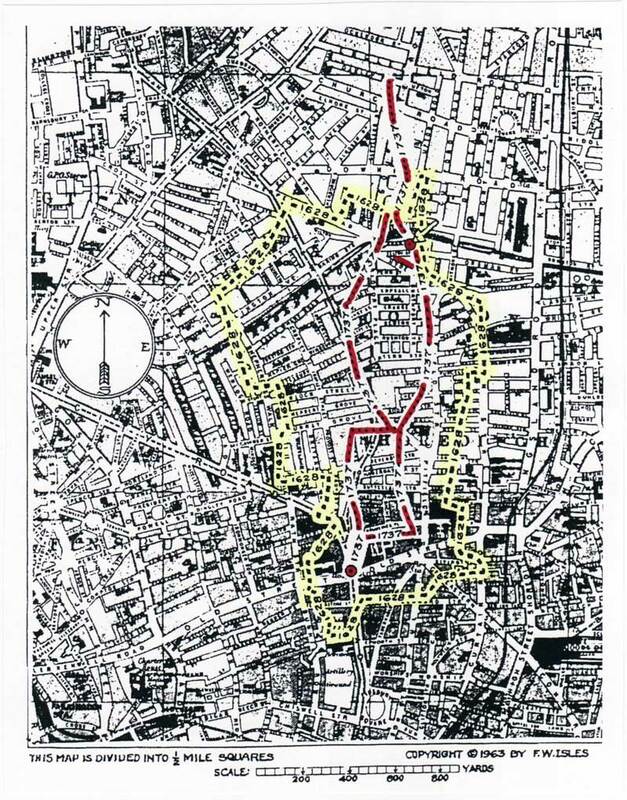 Before 1650 it was headquartered in the Artillery Gardens in Spitalfields, near today's Artillery Lane and Artillery Passage; the 1558 map also shows musketry being practised there, with little puffs of smoke. Archery in Finsbury Fields was more public, taking place on 11 acres of ground north of Chiswell Street which had been allocated for the purpose by the Mayor of London in 1498. Located around Finsbury Fields was a series of 'archery marks', the Finsbury Marks, as targets to be shot at in turn. The Finsbury Marks were 3-4 feet high, originally made of wood (later stone), each with a slot in the top to hold its individual identifying emblem. A fine engraving survives (Fig 2) of King Charles I shooting in Finsbury Fields; two of the archery marks are depicted in the background. The objective was to land your arrow as close to the mark as possible; then whoever was closest had the honour of choosing the next mark to aim at. with two Finsbury Marks in the background. A succession of small books entitled 'Ayme for Finsburie Archers' was known to have been published in 1590, 1594, 1601 and 1628, listing all the Finsbury Marks then in use. 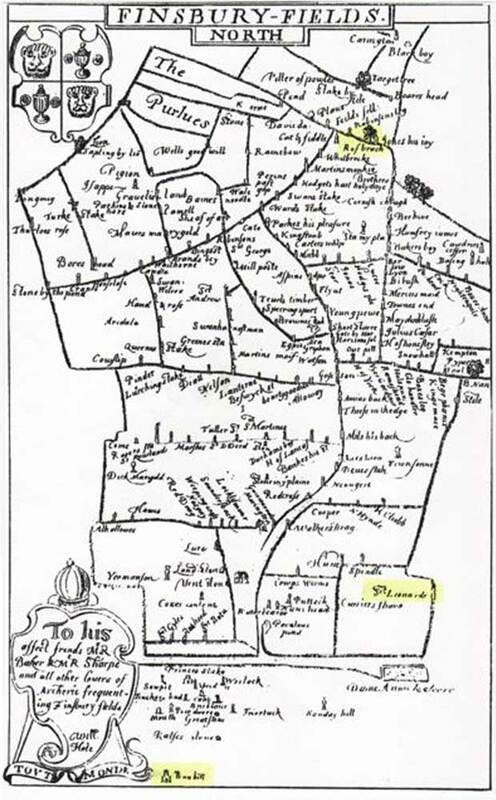 The earliest map of the marks that survives is from 1594 (Fig 3), when there were 194 of them. The names ranged from the simple ('Lion', 'Pigeon', 'Star') to the fanciful ('Kings Kindness', 'Aeolus', 'Parks of Pleasure'), and several were named for archers of the day ('Pritchard's Hope', 'Hodge's Pleasure', 'Baines his Needle'). Just a few of the names on the 1594 map help us identify their locations: 'Bunhill' at the south, 'St Leonard's' to the east, and 'Rosemary Branch' in the north, the name of an inn that was frequented inn en route. The surviving 1628 edition of 'Ayme for Finsburie Archers', republished in 1998, listed every one of the Finsbury Marks (then 164), the choice of which marks could be shot at next from there, and the distance to each mark (Fig 4). Distances were expressed in Scores and Yards: thus 'Egpie to Archdale 17,5' was a distance of 17 score and 5 yards, 345 yards, substantial by today's standards. 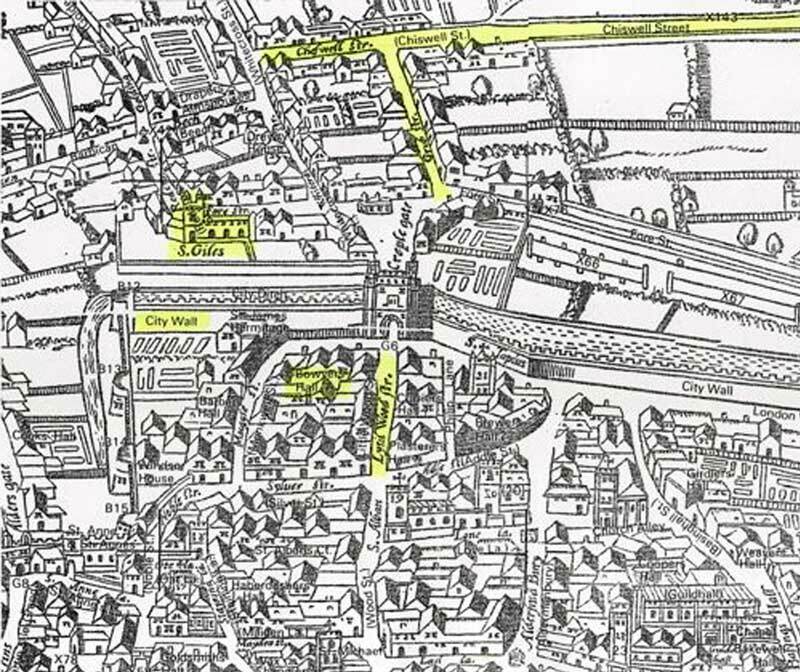 Bowyers and fletchers sold their wares to the Finsbury Fields archers in the notorious Grub Street (now Milton Street), between Chiswell Street and Cripplegate. The pre-Fire Bowyers' Hall was nearby, just inside the City wall, off Wood Street (Fig 5). Interest in archery had held up well during the 16th century, but its effective military role had disappeared, and in 1595 the decision was made to stop enrolling archers for military training. 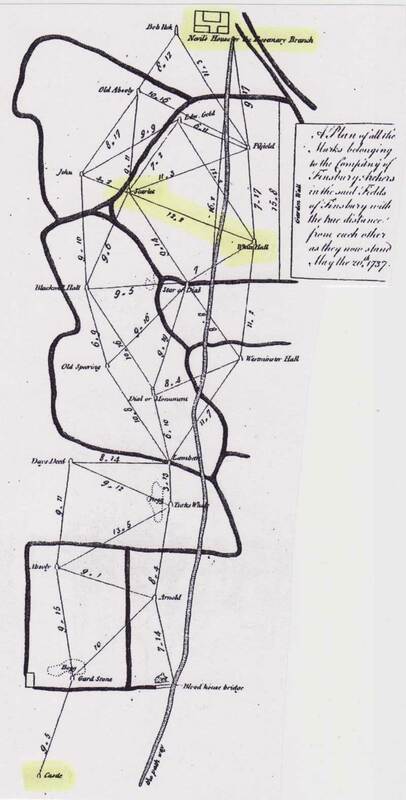 The Finsbury Fields were at some risk too: villagers had been encroaching on to the archery fields, and Stow reported in 1598 that "by closing in on the common grounds, our archers, for want of room to shoot, creep into bowling alleys and dicing houses, where they have room enough to hazard their money at unlawful games." 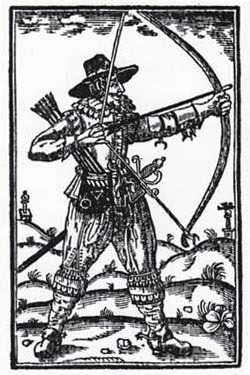 Successive monarchs did their best: in 1605 King James I decreed that the Finsbury Fields be protected for archery, and in 1633 King Charles I (himself a keen archer, as we have seen) decreed that archery should be practised on Sunday afternoons, after divine service. Unfortunately, not much notice seems to have been taken of Royal Decrees. After the disruptions of the Civil War, the Honourable Artillery Company moved its headquarters from the Artillery Gardens in Spitalfields to its present Armoury House ground in Bunhill Fields, and took over the management of the Finsbury Marks, later remaking them in stone. But the decline had set in, and whereas 3,000 archers had paraded in 1583, only 350 archers paraded in 1675. By 1737 only 21 Finsbury Marks remained, and after 1786 no further attempt was made to preserve their use. 'Perambulations of Islington' in 1858 reported that only two stone pillars were still standing: 'Whitehall', dated 1683, with the HAC coat of arms on a small iron plate Fig 6), and 'Scarlet', which was later built into the brickwork of a canal bridge on the New North Road, whence the HAC recovered it in 1881. The only known surviving mark, it is now on display in Armoury House (Fig 7). 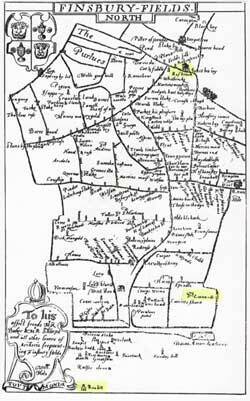 The last remapping of the Finsbury Marks took place in 1737, when (as noted) just 21 were preserved. A drawing survives (Fig 8) showing the names and distances. 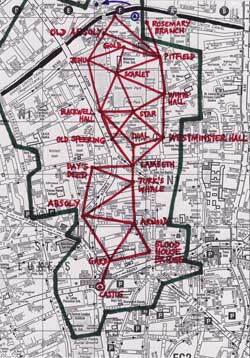 We can identify the specific locations of the southernmost mark, 'Castle', near where Old Street roundabout is now, and 'Rosemary Branch' at the north, and from those we can map where the rest were. 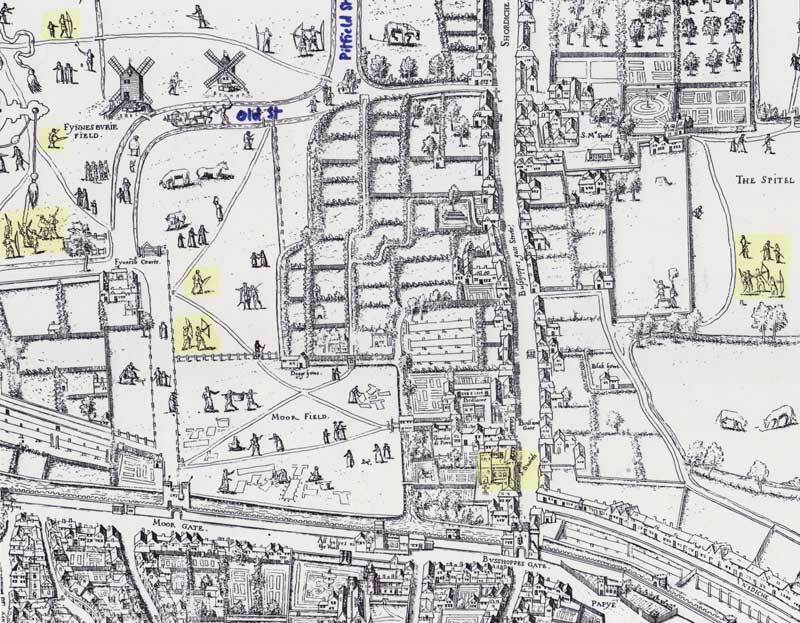 'Scarlet' and 'Whitehall' were in what is now Shoreditch Park. boundary areas on a 1963 street map. 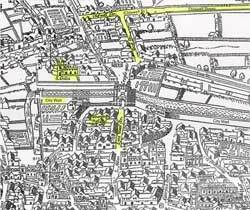 In 1963, Frederick W Isles marked the 1628 and 1737 Finsbury Marks boundary areas on a 1963 street plan (Fig 9). 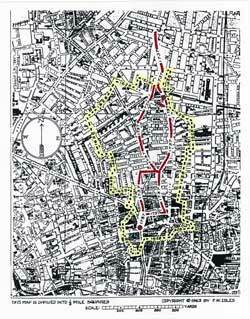 The whole area in 1963 was a dense network of residential streets, constructed over the Finsbury Fields area in Victorian times for workers' housing. Most of these streets no longer exist today, having been replaced by residential tower block estates, with few landmarks remaining. 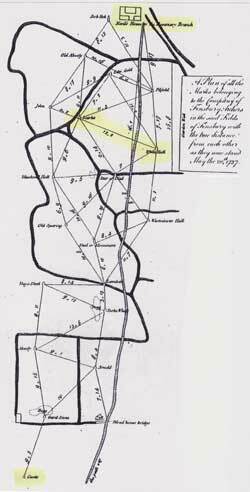 For this paper, the 1737 marks (and the 1628 boundary path) have been identified and marked afresh on a 2007 street map (Fig 10). 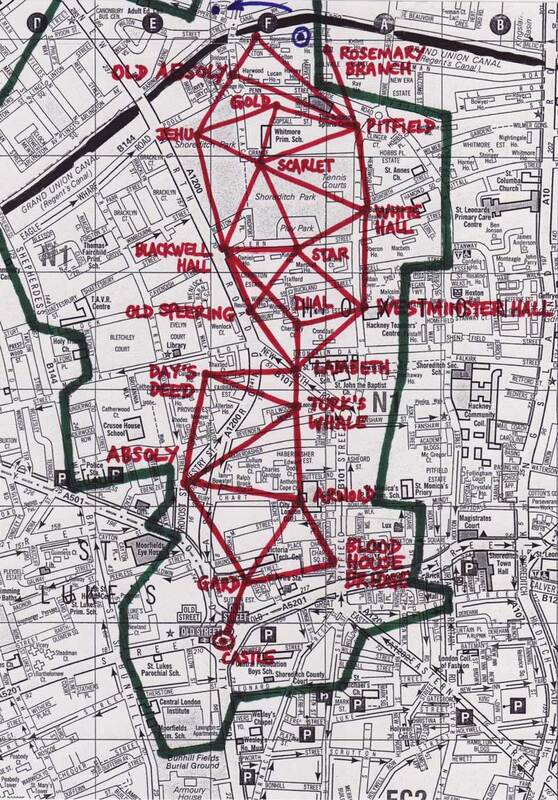 Most of the area is now covered in residential tower blocks, but the northern third has been opened up to form Shoreditch Park, bounded by the locations of 'Jehu', 'Gold', 'Pitfield', 'Whitehall', 'Star' and 'Blackwell Hall', with 'Scarlet' in the middle of the park. the canal from the original one. 'Rosemary Branch' at the north end of the Finsbury Marks area (see Fig 10) was originally a tributary or 'branch' of the river that was later transformed into the Regent's Canal, but it had long also been the name of an adjacent inn. It obviously made a convenient refreshment stop for the archers as they went round the Finsbury Marks circuit. The old Rosemary Branch inn was demolished in the 1780s as the Finsbury Marks became defunct, but a new Rosemary Branch pub was opened in 1811, 100 yards away across the canal bridge on Shepperton Road, N1, where it still thrives today (Fig 11). 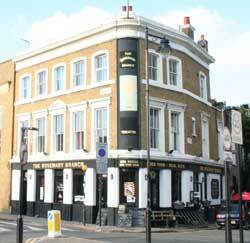 The current pub makes no mention of its historical connections with archery. When it opened in 1811, the field behind it became a centre for the newly fashionable sport of ballooning, as depicted on the pub's walls today. November 2007, for the Worshipful Company of Bowyers. 'Ayme for Finsburie Archers' of 1628 by James Partridge, republished by WC Books of Whitnash, 1998. 'The A-Z of Elizabethan London' by A Prockter and R Taylor, published by Harry Margary of London in association with Guildhall Library, 1979.